Charge Shot!!! : Why Didn't Mars Need Moms? Why Didn't Mars Need Moms? I take a petty, completely unearned pleasure in big-budget movies that flop horribly. Not only do these productions make for INTERESTING STUDIES in ARTISTIC HUBRIS and CREATIVE RESTRAINT, they also signal to me that Americans have not completely fallen free to the cogwork of the modern marketing machine. Sometimes when I look at figures (such as the fact that Transformers 2 made over $400 million domestically), I'm convinced that Americans are nothing but brainwashed lemmings who automatically go see whatever dross Hollywood executives shovel in front of their faces. But major flops indicate that we retain a modicum of good taste; you can't force us to watch something that looks like complete crap! So the recent failure of Mars Needs Moms makes for an interesting case study in modern films. The Robert Zemeckis (Back to the Future, Forrest Gump) helmed film crashed hard over the weekend, only netting $6.9 million in sales on a $150 million dollar budget. In a world where the opening weekend usually accounts for the bulk of a film's profits, this is a very poor sign indeed for Zemeckis, and Walt Disney Studios. Disney has canceled Zemeckis' next project, a CGI-tinged remake of Yellow Submarine, and Zemeckis has reportedly retreated to Montana to find himself or something like that. What went wrong? The movie is based on a popular children's book, which means a built-in audience. How did this go horribly wrong when Gnomeo and Juliet topped the box office just a few weeks ago? Well, the interesting thing about Mars Needs Moms is that it's impossible to pinpoint what, exactly, tripped it up. In fact, there's a number of intersecting possibilities, which can also be read as a microcosmic warning for the future of the film industry. What are the possible reasons? Read on after the jump to find out! The internet has been typing about this until their fingers are nothing but bloodstained stubs. Nobody likes 3-D! It's overpriced! It's too dark to see anything! It's a cheap marketing gimmick to draw audiences to a subpar film! Most 3-D films are recorded in two dimensions and then the effects are added! Yet studios keep cranking about this multidimensional extravaganzas at an alarming rate. Whereas Zemeckis' 3-D Beowulf a few years ago was at least original enough to draw enough viewers to break even, the current market is flooded with 3-D. And perhaps Mars Needs Moms is the straw that breaks the camel's back. 2010 was a pretty good year for the "children's" movie. Toy Story 3 and How to Train Your Dragon cleaned up at the box office and also received a large amount of critical acclaim. These were movies that managed to appeal not just to children, but to a large section of the American movie-going populace. Cut to 2011. Forget about Rango and Gnomeo and Juliet, both incredibly recent, but loads more animated children's movies are just around the corner, including Cars 2 and Kung Fu Panda 2. There's only so many times that the average American family can afford to go to the movies a year. Do you think that the single mother who just took her two children to see Rango is going to shell out another $30 bucks (plus snacks!) to see Mars Needs Moms? I doubt it; there's only so much parents can take, aesthetically as well as financially. Speaking of appealing to a large demographic, what about the marketing campaign behind the movie? 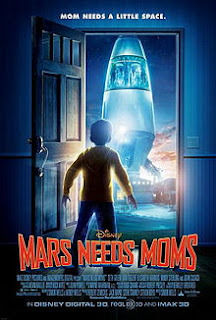 Rather than trying to pitch the film as suitable for all ages, ala Pixar, Mars Needs Moms strikes me as a movie targeted specifically at small children. Granted, the title comes from a Berkeley Breathed book...but Mars Needs Moms? Really? Do you except teenagers to want to go see this, let alone adults? The trailers for this movie do nothing to distinguish the film from the scores of other cheap children's animated flicks that come out each year. Whatever audience the marketing juggernaut of Disney was aiming for, they clearly didn't connect. Robert Zemeckis, an Oscar-winning director, has spent the last ten years shunning human actors in favor of motion-capture computer technology. This has resulted in films such as The Polar Express, Beowulf, and the recent A Christmas Carol. These are movies that are taking new and unprecendented strides in film technology. The problem is that these movies look really creepy. The motion capture technology is close enough that the figures look lifelike, but not so good that they look like actual human beings. The result is an unsettling compromise, neither cartoonish nor realistic, in which the characters look like cold robots or unfeeling automatons. It's possible that Americans want their cartoons to look like cartoons, not an almost-but-not-quite imitation of a human being. This time of year is pretty much the dumping grounds for bad movies. We coming off the highs of Oscar season, and we haven't yet reached the guilty pleasures of the summer blockbuster. March and April are the dead zone, the graveyard in which the studios can get rid of all those films they're contractually obligated to release. Why release a $150 dollar mega-Zemeckis-movie during this time period? No one's going to the movies. Make it a summer film. I wouldn't know. Haven't seen it. And, for the five reasons listed above, I don't intend to.